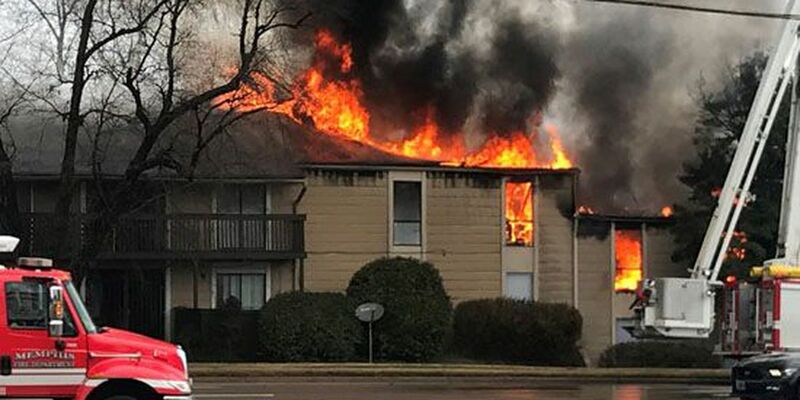 MEMPHIS, TN (WMC) - First responders found two bodies inside an apartment that caught fire Thursday afternoon. The fire started around 12:30 p.m. inside a unit at Clearbrook Village Apartments in the Parkway Village neighborhood. The fire caused a panic in the area, with first responders and people alike rushing in to help. "All I could hear was people screaming and hollering, trying to get people out of the building," Carol West said. For more than 30 minutes, the fire ripped through 16 apartment units. One of the units was filled with live ammunition which started exploding as the fire raged on. Memphis Police Department said officers responded to a robbery call in the area before the fire started. "I was in the house and I just hear the police say, 'Stop freeze! Stop freeze!'" Regina Brown said. "A guy was running and it was about seven police running behind him. Then after I saw them running, I looked up and saw the apartment on fire." As the investigation continued, two bodies were found inside the burned apartment complex. The cause of death for the two victims has not been determined. Apartment residents said the two who died were a couple in their 30s or 40s, but did not identify them. MPD said one person is in custody. That person has not been identified, nor has MPD released the criminal charges the suspect faces.